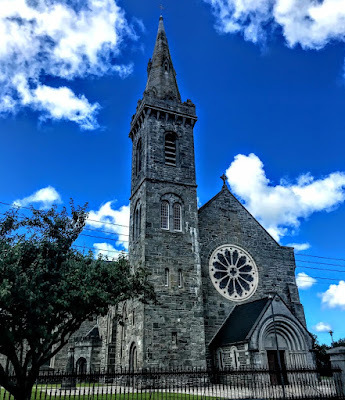 On the way to and from Scattery Island on Friday [10 August 2018], two of us took time to enjoy the streets and architecture of Kilrush, Co Clare, one of the listed Heritage Towns of Ireland. 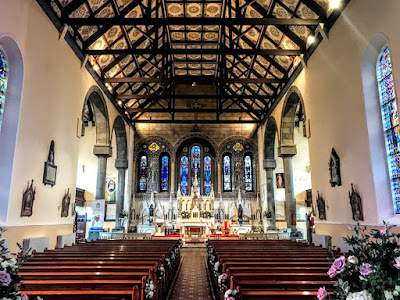 The name Kilrush means ‘Church of the Woods’ and both the Roman Catholic and former Church of Ireland parish church in the West Clare town are named after Saint Senan, the saint linked with the monastic site on Scattery Island. Saint Senan’s Roman Catholic Church on Toler Street stands on a site donated by the local landlord, Colonel Moore Vandeleur, who also gave a gift of £500 towards building the church. 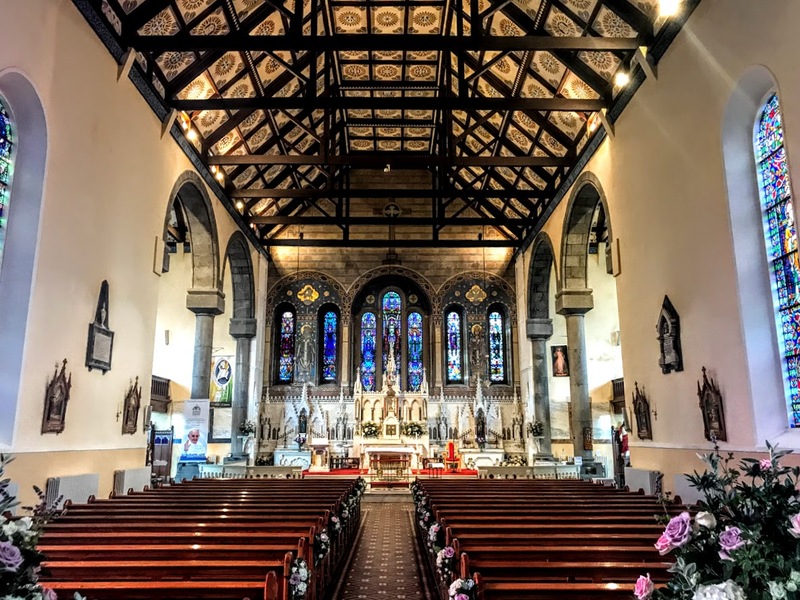 The church was designed by the Limerick-based architect William Henshaw Owen (1813-1853) began working with his father in the Board of Works. He was sent by the Board of Works to Limerick as its representative in 1836 and as the Shannon Commissioners’ resident engineer. In Limerick, Owen oversaw the building of Thomond Bridge (1836-1840) designed by the brothers James Pain and George Richard Pain, the Savings Bank (1839) in Glentworth Street, designed by Thomas Deane, and designed the Potato Market and the Mathew Bridge (1844-1846). He died suddenly in San Francisco on 1 June 1853. Meanwhile, the foundation stone of the new church in Kilrush was laid on 1 November 1839 with a reported 10,000 people present. Saint Senan’s Church was built when Father John Kenny was parish priest, who also received a loan of £1,000 from the Board of Works. It was completed under Father Timothy Kelly, and at the time was the largest church in Co Clare. The stone for the church was quarried and carted form Moneypoint. It took about 10 months for the main fabric to be completed. The church was dedicated on 1 September 1840 and was opened on Sunday 29 November 1840, with a reported 20,000 people present, including many from Co Kerry who had crossed on the steamer, the Garryowen. 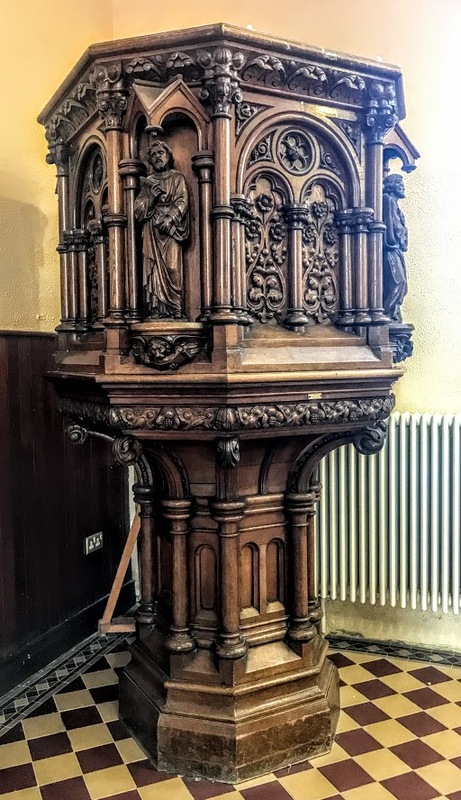 The temperance campaigner, Father Theobald Mathew, was invited to preach the first in a series of charity sermons and Father Thomas Mahony was ordained as part of the ceremony. As parish priest, Father Timothy Kelly (1799-1868) cleared the debt on the building project. He commissioned Pugin’s Irish successor, the architect JJ McCarthy (1817-1882), to carry out a number of improvements in 1858-1861, including the porch, cut-stone portico, and 230 ft tower and spire (1861). Saint Senan’s is said to be the only Roman Catholic Church in Co Clare with a tower and spire like this. 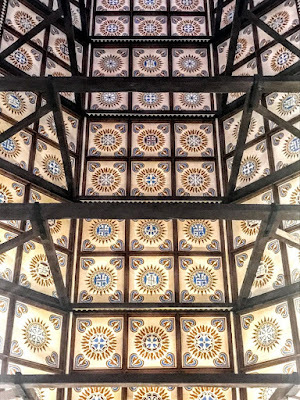 Other improvements in this phase include the interior ceiling, the interior plastering, altars, floors, seating, and the wall and railing outside. When the seating was completed, a three-week mission held in the church, an event marked by a limestone cross near the entrance to the church. Father Kelly also introduced the Sisters of Mercy Convent to Kilrush, and their convent was also designed by JJ McCarthy in 1862. When Father Kelly died 150 years ago, on 13 March 1868, he left his home on Frances Street, Kilrush, for a Christian Brothers’ monastery. The sanctuary dates from 1881, when the old wooden structure was moved to Monmore Chruch. A new organ was installed in 1878. Dean John McInerney was appointed parish priest in 1906. He undertook a full restoration of both the interior and exterior of the church. He engaged Pugin’s son-in-law, the architect George Coppinger Ashlin (1837-1921), who designed the communion rails, the wooden pulpit and four wooden confessionals, advised on the windows in each transept and in the chancel, and the extension to the priests’ sacristy. 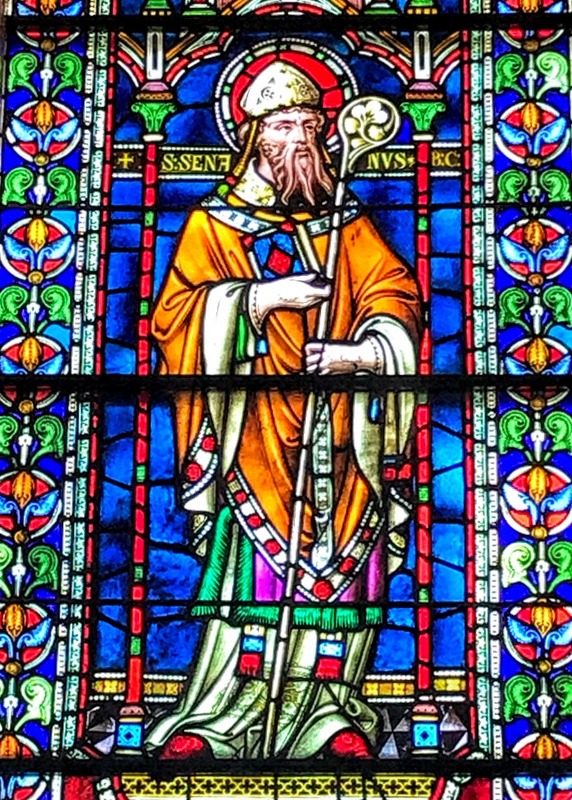 Canon PJ Hogan as parish priest commissioned the three sanctuary windows from the Harry Clarke Studios in Dublin in 1932. 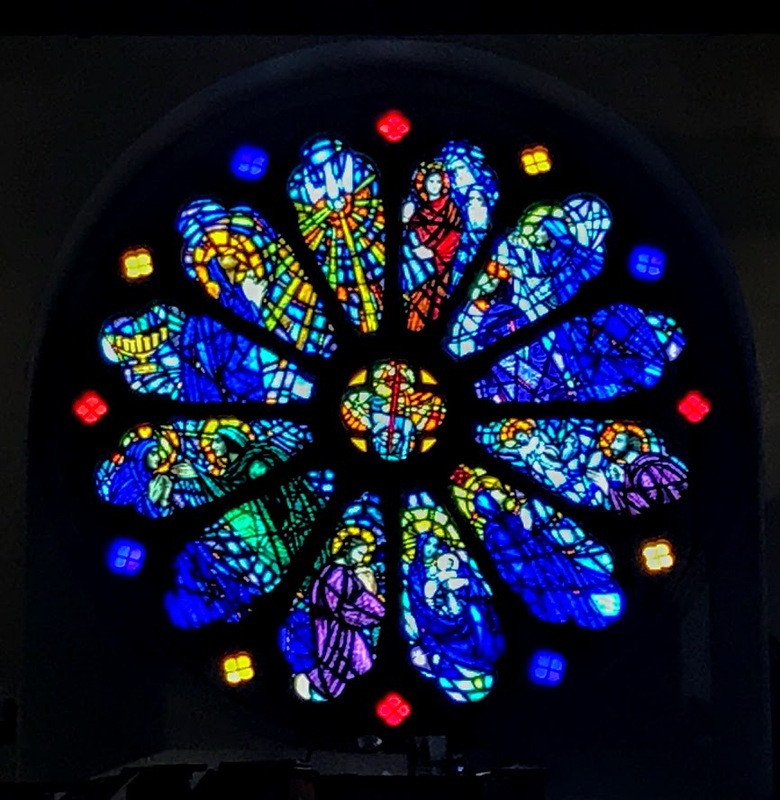 The window on the left wall which depicts Saint Brigid and Saint Mel at Saint Patrick’s Synod was also designed by the Harry Clarke Studios. During Canon Hogan’s time, the mosaic floor in the sanctuary was laid and a central heating system installed. 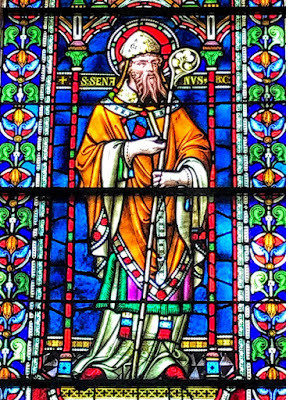 Saint Senan’s is a cruciform-plan, double-height church. It has a three-bay side elevation, single-bay transepts, a single-bay single-storey flat-roofed crenellated side chapel to the left, and a pair of gable-fronted two-bay single-storey sacristies to the rear. 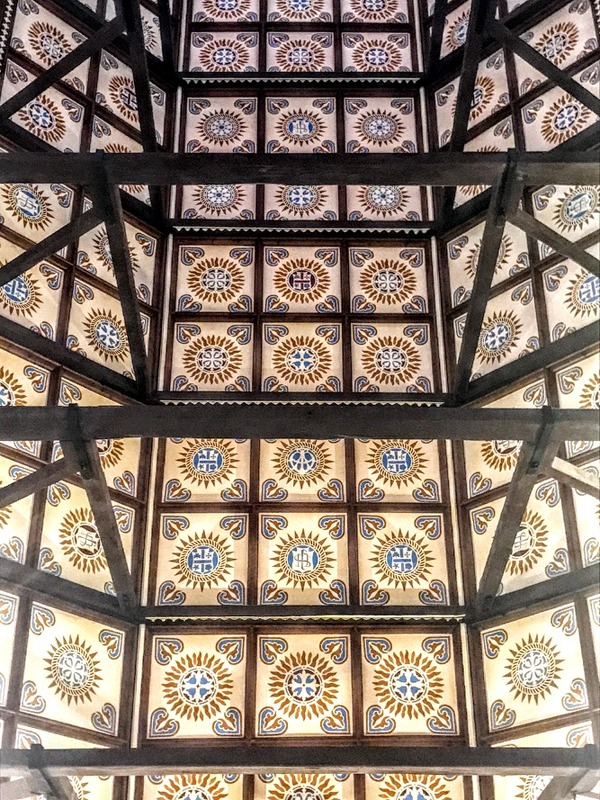 Inside, the church has a queen post truss timber roof structure with painted ceiling panels, cut-stone arcades to the transepts and mosaic tiles in the passageways between the pews. 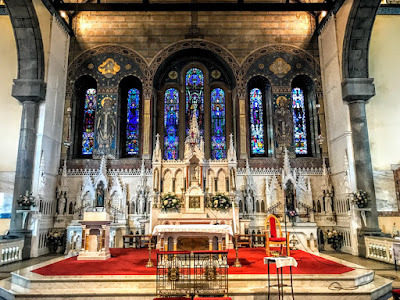 The stained-glass windows are by Professor Frederick Settle Barff (1823-1886), a former Anglican priest who was also responsible for the windows in Saint Catherine’s Church, Meath Street, Dublin, and by the Harry Clarke Studios in Dublin. The windows by the Harry Clarke studio include the sanctuary windows and a window on the liturgical north side wall (left) illustrating scenes from the life of Saint Bridget, including receiving a crozier from Saint Mel. The rose window over the entrance has carved colonnette spokes and stained glass. The single-bay, four-stage tower and octagonal cut-stone spire was added by JJ McCarthy. There is a gabled porch addition at the entrance gable, and the projecting porches were added to the transepts around 1990. Outside, the priests’ graves are marked by Celtic crosses, there are cut-stone gate piers and a plinth with cast-iron railings, a wrought-iron lantern-holder and cut stone steps. 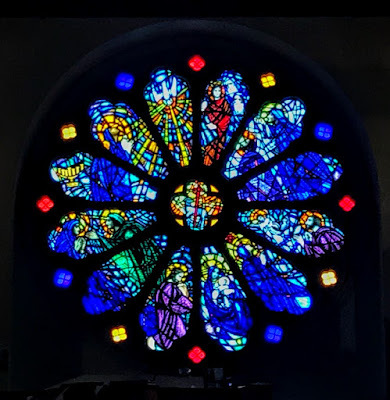 The Lonely Planet recommends visiting Saint Senan’s Church in Kilrush for the rose window and the four windows by Harry Clarke. 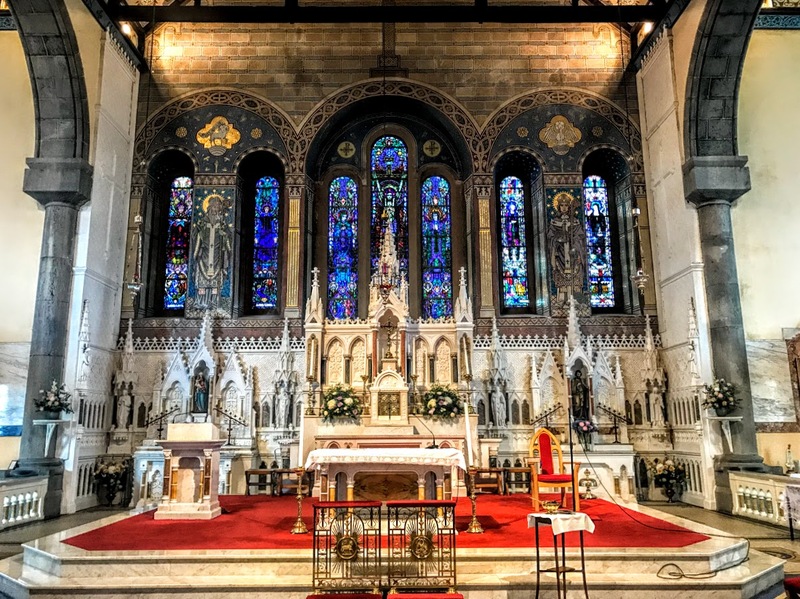 For Saint Senan’s Church, the former Church of Ireland parish church, visit HERE.